For anyone who has constructed green infrastructure in a roadway right of way, identifying opportunities within the spaghetti system of utilities can keep you awake at night. Gas lines, fiber optics, electrical duct banks, above ground utility poles, street signage, street trees and guard rails, can all shrink the potential BMP implementation footprint to negative numbers. That’s why it’s important to step back from the prescribed BMP manuals, consider why these design standards were created and find inventive new designs and technologies to provide the same or better benefits. The Marshallville Park Street Green and Complete Street project is a juxtaposition of BMP design standards with multiple new design methodologies and technologies, contrasting each system in a singular area. The Village of Marshallville, with a population just under 800, is located in the eastern part of Wayne County, Ohio. Localized flooding and drainage have always been a concern for the Village. Geographically located at the headwaters of the Tuscarawas River, there is very little topographic relief in the Village and soils are heavy clay with low permeability. The Village owns and operates its own utilities including water, sanitary sewer and electric services. Over the past ten-years, the Village of Marshallville has been proactive with efforts to upgrade its infrastructure including a new wastewater treatment plant, waterline upgrades, wetland creation and various street improvements. The Village was in need of replacing a water line along Park Street, which was the last segment in the Village wide water infrastructure improvements. Additionally, this segment of Park Street is one of the last sections of walking paths to connect the Village Park to the future Rails-To-Trail (Heartland Trail). 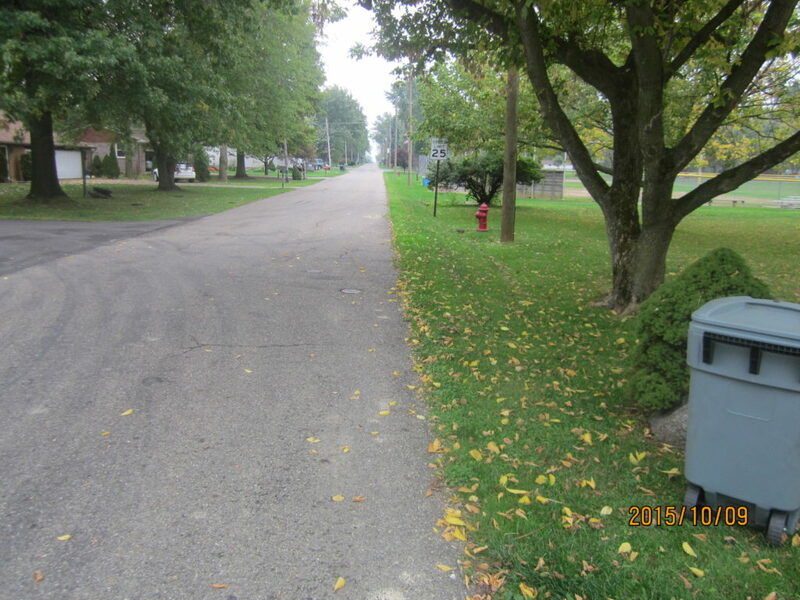 The Village of Marshallville plans to remove and repair a portion of the road to install this water utility providing the opportunity to install cost effective stormwater mitigation through the creation of a demonstration suburban green and complete street. The completed design included a utility friendly pervious pavement all-purpose path that captures and treats stormwater on one side of the street. The typical rectilinear pervious pavement installation was modified to incorporate an underground infiltration trench, which weaves in and out of underground utilities. A portion of this trench also uses expanded shale technology (Haydite), which can provide additional water quality benefits in a cost effective manner. This is designed to capture and enhance infiltration for a 1yr/24hr storm while still enabling drive access, pedestrian traffic and room for underground utilities. The opposite side of the street includes four different bioretention designs and technologies. Two of the four technologies include high flow rate soils, which allow stormwater to flow faster through the media, elongating the stormwater’s contact with existing below ground soils, thereby expanding the overall infiltration potential. The remaining two technologies are typical bioretention designs prescribed in the Ohio Department of Natural Resources Rainwater and Land Development Manual (2012 and 2014). No other application in northeast Ohio includes these four technologies juxtaposed in a way that allows scientific study of the operation and maintenance of these technologies. One of the new technologies used is a high flow rate bioretention system called FocalPoint. This T.A.R.P. tested system provides equal water quality treatment with a smaller footprint than a traditional bioretention. The Village of Marshallville is continuing with its proactive efforts to improve the health, well-being and environmental aspects of its citizens and become a regional example of pragmatic sustainability. Five years ago the Village installed a wetland next to their waste water treatment plant and last year installed a solar field. This project provides a new regional design model for suburban stormwater control through a simplified Green and Complete Street Design. The project was wholly funded by grants from the Ohio Environmental Protection Agency, Muskingum Watershed Conservancy District and Ohio Public Works. The Village will provide post construction operations and maintenance of the project. The project also includes permanent educational signs at each of the BMP sites. Click here for the Marshallville Green & Complete Street fact sheet.